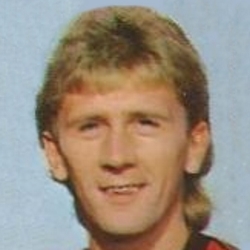 Iain started his professional career with Dundee, who signed him from Fir Park Boys Club in 1978 and after making his debut scored his first senior goal at the age of 16. A first team regular under Don Mackay, the Dark Blues won promotion to the Premier Division in 1981, and Iain gained international recognition at Under-21 level. 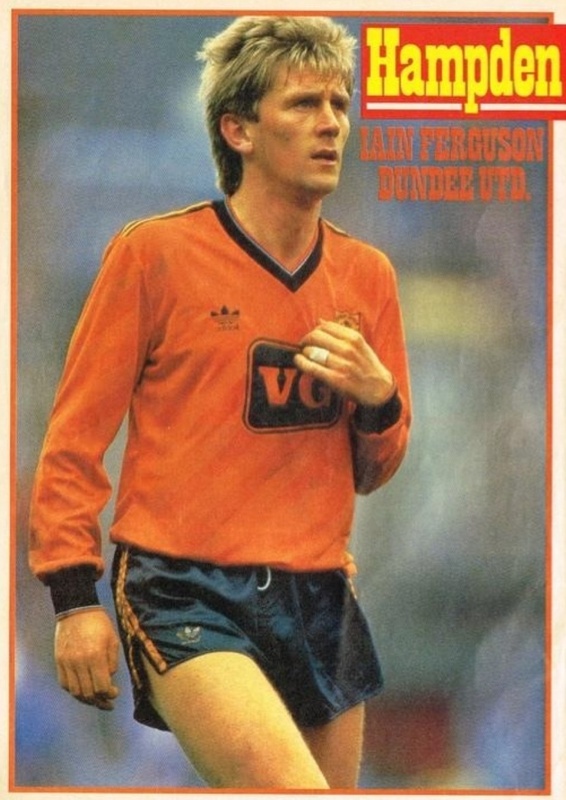 In the final league game of the 1982-83 season, Ferguson scored to pull a goal back against United at Dens Park, as the Tannadice side went on to win the Premier Division for the first time. Having scored regularly against the Ibrox side, Rangers signed him in 1984 for £200,000, and within months he collected a winners medal, scoring the only goal of the 1984 League Cup final against United at Hampden. He then scored two goals against Inter Milan in the UEFA Cup but later found it hard to hold down a regular place in their side. 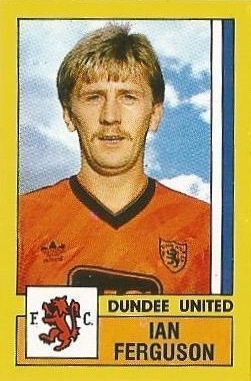 He returned to Dens Park on loan at the start of the 1986-87 season, and they had a transfer offer rejected by Rangers. Jim McLean then stepped in and brought the striker to Tannadice for £145,000 after two previous bids had been turned down. He made his debut against Hearts the next day. His scoring rate in his first year was remarkable, including a memorable strike from near the half-way line against Hearts at Tannadice in December 1986. 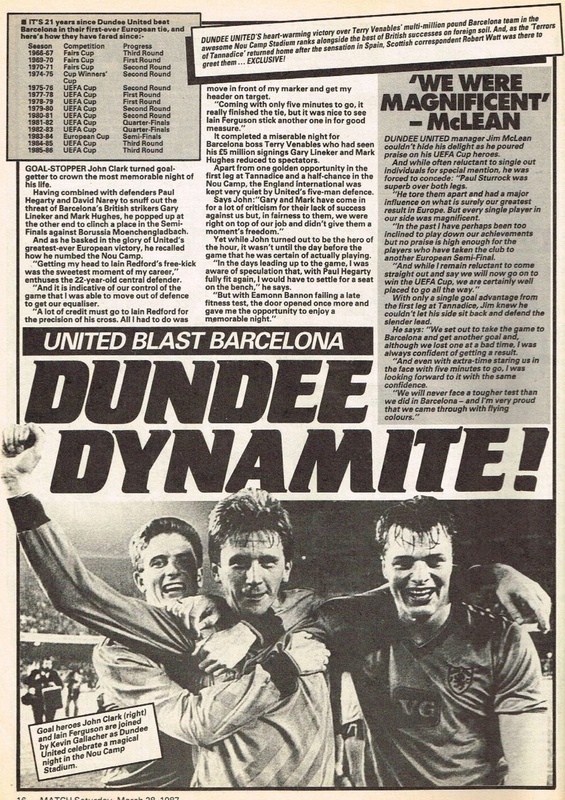 He also scored many important goals that season, including a late penalty equaliser against Forfar Athletic to keep United in the Scottish Cup, and scored a brace against Dundee en route to a Scottish Cup final against St Mirren. Having been cup tied for the earlier rounds of the UEFA Cup, he went on to score against Barcelona and Borussia Monchengladbach on the way to the UEFA Cup final against IFK Gothenburg. Unfortunately, both competitions ended with United as runners-up. 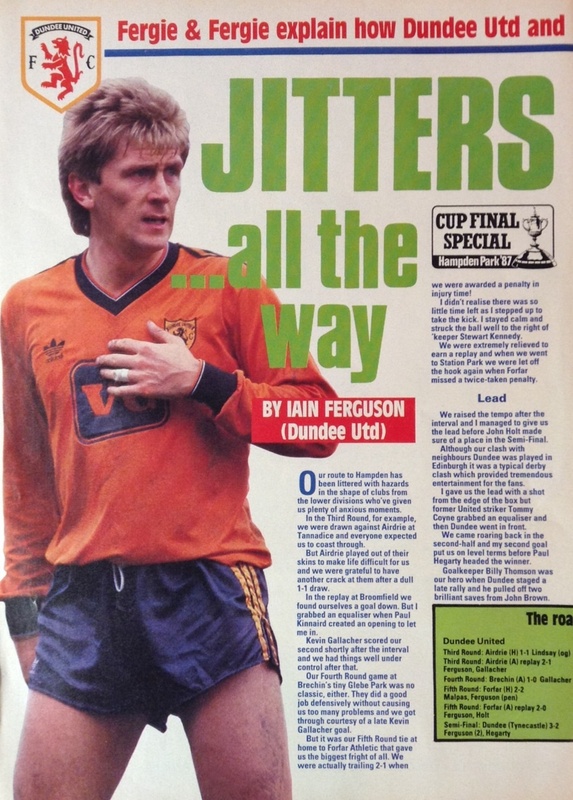 In 1987-88 he scored the all-important semi-final goal against Aberdeen at Dens Park to set up a Scottish Cup final against Celtic, but again finished on the losing side. A phenomenal instinct for goal, Iain was the Clubs top scorer in each of his two seasons at Tannadice. 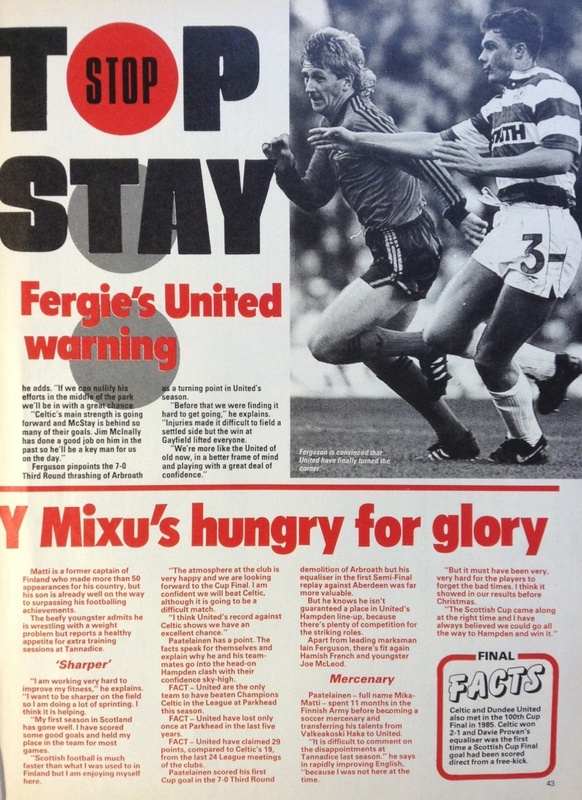 He left United in July 1988 to join Hearts for £325,000 and although the fee was to be set by a tribunal, the clubs settled at £325,000. Remembered at Tynecastle mostly for his strike against Bayern Munich in the UEFA Cup, he also had loan spells at Charlton Athletic and Bristol City before signing for Motherwell in December 1990. 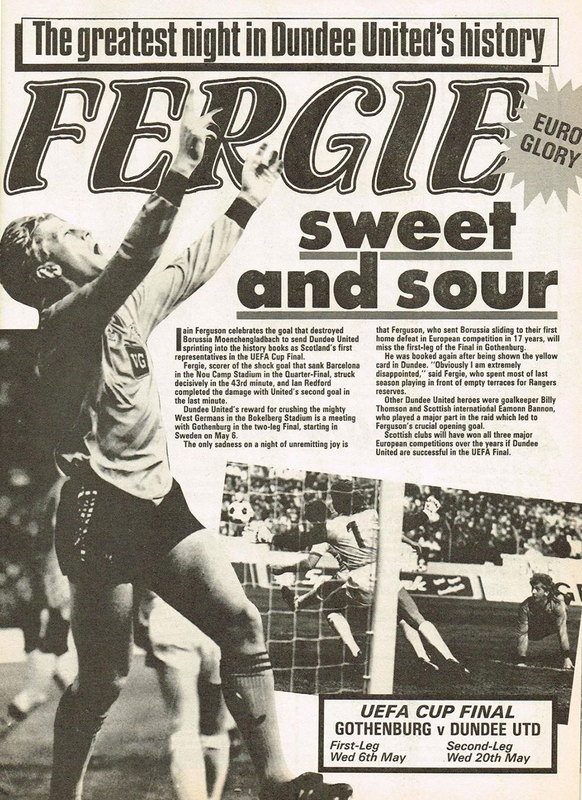 He helped them to a Scottish Cup final win over United in May 1991, scoring one of the goals. His next move was to Airdrieonians and then to Portadown, before returning to Dundee for a third spell where he ended his senior career. He played briefly for Gretna before the became a Scottish league club. 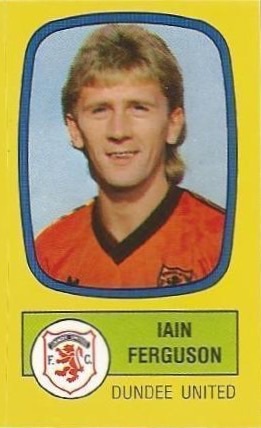 Iain was born on this date in Newarthill. Played at great pace this was an entertaining match more typical of a cup tie. Hearts, particularly In the second half, had more of the play but the points went to Tannadice thanks to a Paul Hegarty header. Only five minutes were on the clock when Hearts had the ball in the net, but a linesman's flag indicated the ball had gone out. Foster then had a chance but shot over the bar. John Clark's shot which went narrowly past was our first threat after 15 minutes. Kevin Gallacher then had a useful effort blocked and Smith had to look lively to save a Paul Hegarty header. 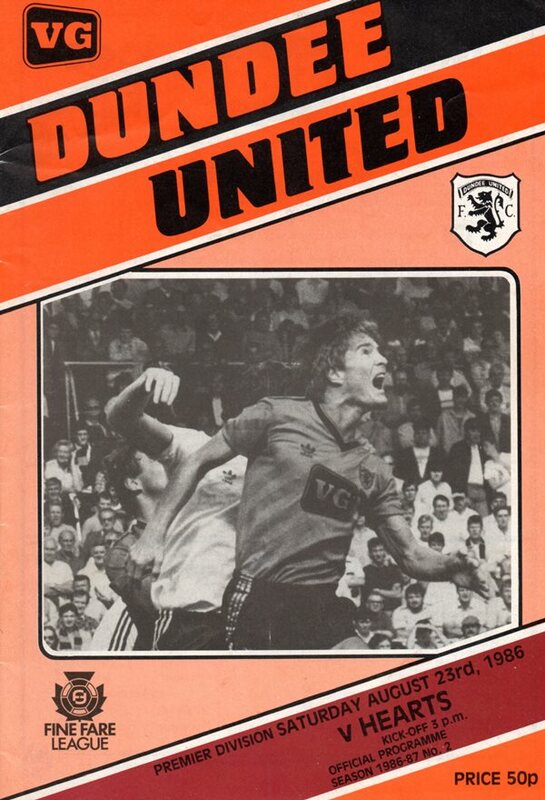 Nine minutes later Paul Hegarty wasn't to be denied when he somehow reached a cross from Paul Sturrock to loop a header over the outstretched arm of Henry Smith. Predictably against any side under the control of manager Ally McLeod, Ayr United fought valiantly and, particularly, in the latter stages of the first half, proved a real handful. A Kevin Gallacher goal early in the second period, however, settled us and allowed us to play some of our best football of the season so far. We started well enough, Iain Ferguson was denied by the last minute intervention of an Ayr defender, Iain then headed a Kevin Gallacher cross narrowly past. Billy Thomson then parried Irons' shot around the post but the best chance so far felt to Kevin Gallacher, but he screwed his shot over the bar. The Fifers may have been officially consigned to the First Division, but they went down fighting after a whirlwind start by us. lan Redford headed the ball down to Joe McLeod. Joe's shot was blocked and broke to Eamonn Bannon. Eamonn turned the ball back into the middle and Iain Ferguson, lurking at the back post, hammered the ball past McKellar - time only three minutes. Our second goal came three minutes later. 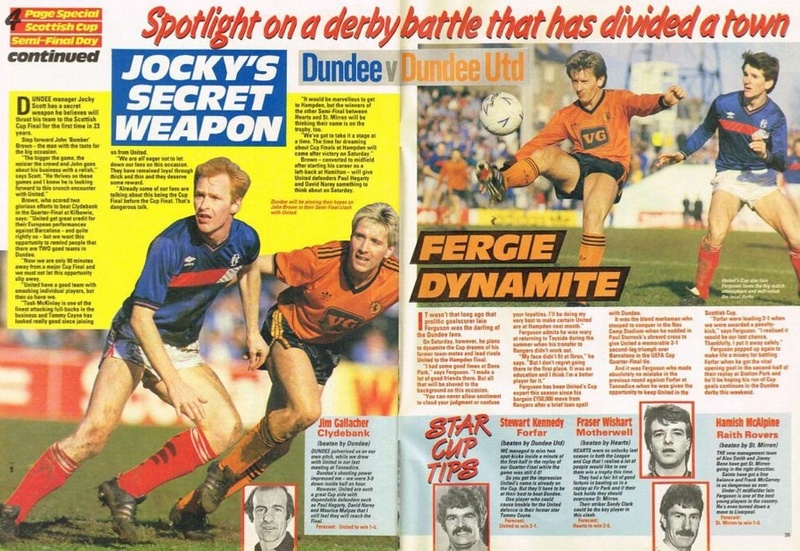 Some neat interplay between Kevin Gallacher and Joe McLeod saw Joe go on to beat Riddell and Jim McInally scored with a diving header. When Jim Mclnally limped off in the 13th minute we lost a lot of our impetus and the Pars gradually clawed their way back into the game. In the 29th minute Mark Smith won the ball on the half way line and ran on to beat Billy Thomson. The adage that lightning doesn't strike twice was disproved in our fifth Scottish Cup final appearance! Only three years have passed since the 1985 Cup final when we lead Celtic by a Stuart Beedie until late in the game before the Parkhead men hit us late in the game with goals by Provan and McGarvey. Well that was all too accurate dress rehearsal of the 1988 version.